When Ray Tensing, a University of Cincinnati police officer patrolling just off campus, murdered Samuel DuBose during a traffic stop last July (something which I’ve written about at length here), UC found itself, briefly, at the center of the nation’s seemingly endless torrent of police violence. Murders by police continue across the country at a rate that is hard to track—most recently in Louisiana, where two officers have been arrested for shooting a six-year-old boy. But even as we try to process all the new violence, it’s important, especially in our amnesia-ridden news cycle, that we also return, stay focused, and we look at what happens in the aftermath of these killings and other acts of violence. In Cincinnati, some real change is happening. 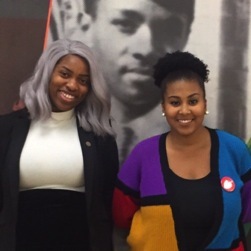 Two University of Cincinnati students leading that change—Ashley Nkadi and Brittany Bibb—are busy. When I met them on the fourth floor of the University of Cincinnati’s Tangemen Center, they were wrapping up a meeting with two representatives from another student group. On the table for discussion were budgets, plans for research, and some slight disagreements about how to proceed. After our interview, they stayed in the conference room, determined to continue working. What else would they be doing on a Friday night? Nkadi and Bibb lead a group—a movement—called the Irate8, named to call attention to the fact that black students make up only eight percent of the university’s student population. Nkadi and Bibb are both seniors at the University of Cincinnati. Nkadi is majoring in neuroscience and plans to go to medical school. Bibb majors in marketing and is clearly putting some of her skills to use in spreading the group’s message. Right now, they’re stressed, they’re worried about their safety, and their hopeful. Their message—that the University of Cincinnati needs to change its culture—is resonating with many students, has flagged the attention of the University’s president (as well as many faculty), national news outlets, and is part of a countrywide discussion about race, policing, violence, and cultural awareness. Eric Van Hoose: Who are the Irate8? What do you want to accomplish as a group? Brittany Bibb: We started around the end of August. The university really didn’t have a response for the Sam DuBose murder. We decided we needed to do something. We never knew it was going to be this big. I told Ashley and some other friends, we need to have a meeting. I texted everyone and we got the vice presidents and representatives from every black student organization on campus and all met up at Ashley’s house. It was an open invitation to all students. We talked about what we wanted from the university and came up with an initial list of demands and our unity statement. We also made a GroupMe. GroupMe is the biggest part of our movement! I made one with everyone that was there. We decided to use the #hottestcollegeinamerica hashtag and tag [University of Cincinnati] President Ono because he’s very active on Twitter and Instagram; we knew that would get to him. If you looked at his tagged photos it was filled with our unity statement. His phone had to be blowing up! We basically wanted him to say that he acknowledged that this was a murder, a hurtful thing. The University kept referring to it as “the incident.” He was still posting regular photos and acting like everything was okay. That’s when we decided to make the videos—to explain why we are here, that we love UC but know there’s room to change. Your movement started after Samuel DuBose was murdered by Ray Tensing, but you seem to have a long view of how your movement fits into larger movements and a longer history. Samuel DuBose’s murder is part of a larger pattern, and your video highlights the history of UC and the problems that have been going on here. Yes, you have really specific ideas about how you’d like to see UC change, but how does this movement intersect with and diverge from larger, national movements? Ashley Nkadi: The demands we have are about comprehensive education and things that will facilitate the recruitment of black students here. People need to engage with people who don’t look like themselves and understand how to be culturally sensitive. It’s Halloween, and I know I’m going to step out and see someone dressed as a Black person, a Mexican, a Native American. And they might not even know it’s wrong. That’s where our classes come into play. The DuBose murder was only an indicator of larger things—those things have always been happening. There have been so many microaggressions, too, that in our daily lives we ignore. After DuBose was shot and killed we were under a microscope, and all these disproportionate statistics, facts, and disparities, started emerging out of the woodwork. We’ve all had bad experiences—been racially profiled, noticed things our teachers have said to us. But when you see the numbers, you realize those bad experiences are indicative of actual disparities in the numbers on campus. If Tensing’s numbers had been pulled before—the data about who he was stopping—would there have been a difference in what happened on July 19th? All the data was there but nobody looked at it until after it was too late. Once we started looking we found this was really a culture that needed to change. There are so many videos of police abusing people. Do you think the media imagery around issues of violence, policing, and race, which circulate so widely on social media, are part of what make what you’re doing resonate with so many people? Ashley: Social media is a gift from God. You can really see how things play out. We knew these things were happening but weren’t being documented. People know there are repercussions now, now people care. They can pull the bodycam footage now; before it was just he said/she said. Kids and people growing up now will never be able to say they didn’t know what was going on, to say they didn’t know it was happening. We can no longer make the excuse that “well, they were raised that way.” Now there’s no excuse not to know, and people are demanding more social responsibility. Are you getting much backlash? Ashley: There are people who call us thugs, who say we got into the university under substandard requirements and have low ACTs and GPAs, that the university allowed us to come here even with our “stupidity.” There’s always been that character defamation happening, but only recently did it turn to actual violent threats. All the negative comments on YikYak, for example have a lot of upvotes. We’ve gotten long messages and tweets saying we’re entitled. There’s a lot of negativity. In the past I’ve just kind of pushed it off because I know these are just hateful people, but some of the threats really have me on edge. Brittany: They’ve put a police detail at the African American Cultural and Resource Center. It’s really scary because so much of it is anonymous. These could be people in our classes who actually know us. So, a curriculum that targets and deals with some of this stuff. . . . You’re proposing a mandatory awareness curriculum. What kinds of things do you want students to learn? What does this look like? Where do you think the climate is now versus where it could be for the students who will be coming in after you’ve graduated? Ashley: We love this school! Brittany: We love the work that’s going into promoting diversity here, but if it’s not mandatory, then that only attracts people who have the time and who are already interested. It’s a good effort, but there’s always work to be done. Ashley: They’re making strides. The campus has changed so much in the nearly four years I’ve been here. But they can do more. Something like 80% percent of schools say they’re committed to diversity, but only about 12% percent have a firm plan, budgets, and staff in place that support those. Bleuzette Marshsall, our chief diversity officer, is wonderful. She puts a lot of time and energy into this university. But look at her resources. There are none. Where is her staff? There is none. She has liaisons. Who are they? They’re deans, they’re people whose primary roles are something else. Where is her budget? There is none. The university is saying they commit to these things but it’s only going so far as making the pamphlet look cool rather than being truly, truly committed. I think that if you had people who worked full time to make sure this campus was more inclusive it would have happened by now. You put together a teach-in, a syllabus, you’ve been working with faculty. What was it like to work with faculty around these issues? Brittany: It’s been amazing. I’m surprised that anyone who isn’t black stood up for us. The anthropology department made signs and started a social media campaign which got an article in A Plus. [The group has also received coverage in The Daily Dot.] Departments are standing up and saying they support the Irate8. Having that support makes the university realize that it’s not just a student group trying to get money or something, that it’s actually a good thing. The teach-in idea was brought to us by a faculty member. She’d heard about teach-ins at other schools and had participated in the Ferguson syllabus. We all worked together to get that started. I think it went very well. We were able to reach a lot of students. Fiction is such a powerful tool for bridging gaps of empathy, for helping people feel what it’s like to experience life from someone else’s point of view. What roles do you see literature and the arts playing in the course you want to create and in your movement more broadly? Ashley: Some people travel and seek out real life experiences, but some people have to create life experiences. Crafting learning experiences for people can help them see where they fit. We try to do that—to use creative analogies for people. Nobody was getting our demands, but if you ask people to imagine that these were demands from students with disabilities, asking for more ramps on campus, for example . . . There are students who need specialized wheelchairs just to attend this hilly campus! So when they imagine it as a list of demands from students asking UC for what they need, then their gears start to shift, and I think literature plays a role in that, too, because it is highlighting excellence: Black excellence, Indian excellence, Asian American excellence. Black excellence exists everywhere. The media just chooses to muddy it. What’s the role of hope in your movement? Where do you turn for hope? How do you stay positive? Ashley: Barely . . .
Brittany: The AARC, Ms. Nikki . . .
Ashley: Christina Brown . . .
Brittany: I could cry. I might cry right now. Ashley: There are people who really support us and that’s where we go. That’s our crutch. It’s really hard. Brittany: We all support each other, check on each other. Sometimes we just need space, need a break.